It's a simple salad -- slices of fresh mozarella, slices of the last of the garden tomatoes and basil leaves, salt and pepper and a drizzle of olive oil. It's formal name is Caprese Salad and it is certainly a favorite at Linderhof. The salad is often on the menu at nicer Italian restaurants. And that it where we first met it, as a first course at an upscale Italian restaurant in Oklahoma. It was definitely love at first sight! It is often on our summer table for the garden basil is lush and we bring home bags of farmer's market tomatoes in the summer. To me, the salad alone makes a great summer lunch with a big frosty glass of iced tea. 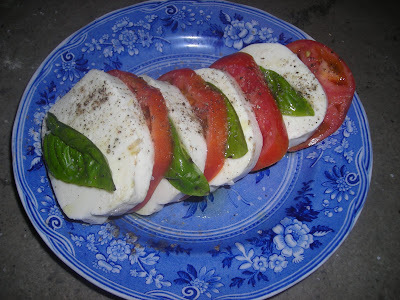 I especially relish the last Caprese of the season as much as I look forward to the first. We'll see our old friend again next summer. Martha, the vivid red, white and blue make the salad almost patriotic. Thanks, Mary. I think all colors look well with blue and white which is why they are my china of choice. Caprese salad is perfection on a plate, and a gorgeous plate yours is. Love the blue and white. Growing up, my grandmother would drizzle her caprese with balsamic and I hated it. Now I do it all the time! Yours looks so fresh and delicious that I am now craving some.